Masaki Gotoh, Partner Chief Investment Officer and Portfolio Manager, Masaki Capital Inc.
Now that the Japan FSA and the Tokyo Stock Exchange have implemented regulations for companies with the Corporate Governance Code and for investors with the Stewardship Code, what happens next? This panel will consider the most effective ways for companies and investors to engage with each other using these available tools. From the constructive investor side, Mr. Gotoh will speak about the unique methods that his firm, Misaki Capital, uses to identify companies with which to engage, and strategies to work effectively with those companies. From the pension fund perspective, Mr. Hokugo from PFA will speak about barriers to engagement that now exist between companies and asset owners due to vague rules and regulations, and the need for collective engagement strategies. From the international institutional investor perspective, Mr. Oguchi from Governance 4 Owners will speak about the effectiveness of the Stewardship Code and voting disclosure in promoting better engagement between companies and investors. 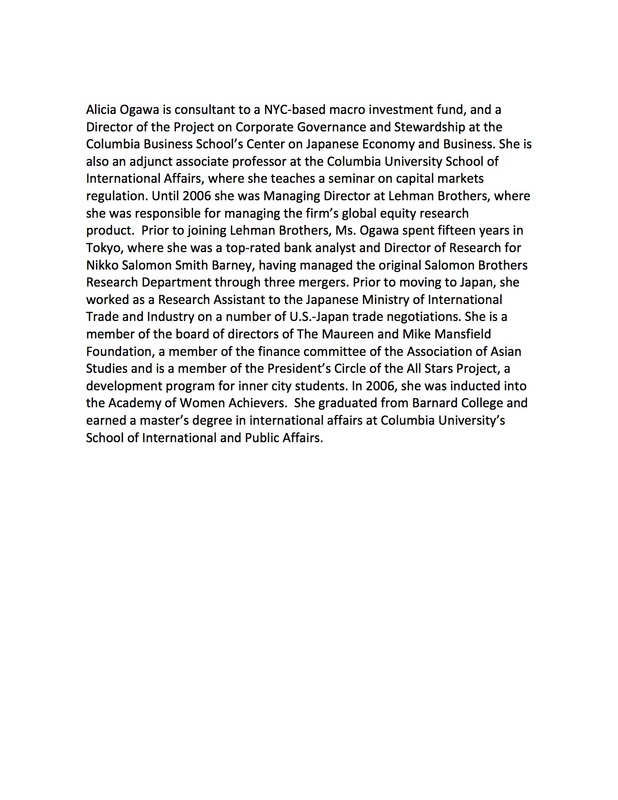 From the academic perspective, Ms. Ogawa from Columbia University will moderate the panel discussion and will speak about the level of activist interest from the US and why Japan should support these trends.